This book is written in white ink. 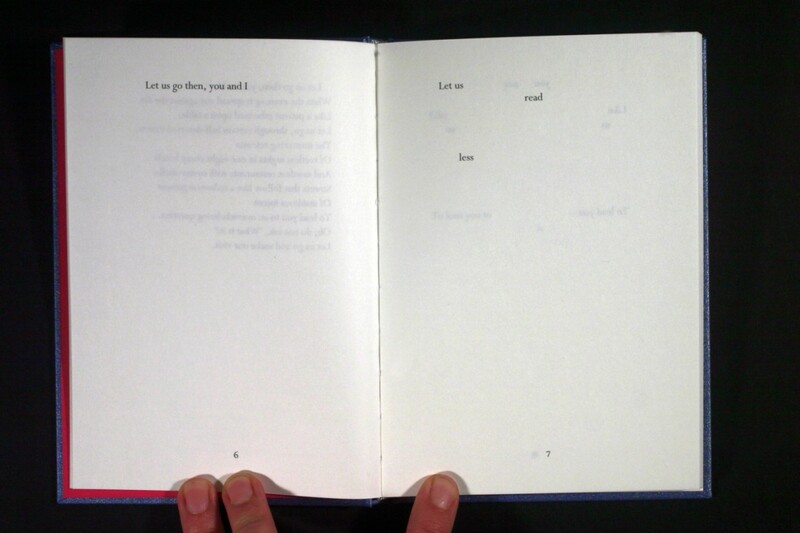 It consists of poems that are all ‘tipp-exed’ (tipp-ex=whiteout) from the same segment of T.S. Eliot’s poem ‘The Lovesong of J. Alfred Prufrock’. Offset printed, sewn, hardcover with foil stamp. 68 pages. Edition of 250 numbered books. Published in Acquoy, The Netherlands, 2003. 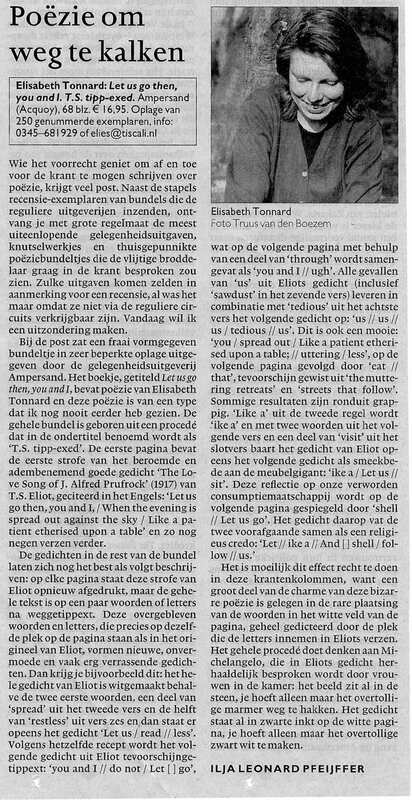 ISBN 90 807884 1 4.
Review by Dutch critic Ilja Leonard Pfeijffer. Bookpresentation by Bas Kwakman. See also my other tipp-ex book, titled We are small. The book is included in the collections of Bibliothèque Kandinsky (Centre Pompidou), Columbia University in New York, Jan Michalski Foundation for Writing and Literature, John M. Flaxman Library at the School of The Art Institute of Chicago (Joan Flasch collection), Kunstbibliothek (Berlin), Kunst- und Museumsbibliothek Köln (Museum Ludwig), MoMA Library, National Library of The Netherlands (Koninklijke Bibliotheek), Tate Library and Archive, The New York Public Library, University of the Arts London (Chelsea College of Art and Design), York University Libraries, Toronto, Zentralinstitut für Kunstgeschichte (Munich).